We are suckers in our house for potatoes. Hash, mashed, baked – we love them all! 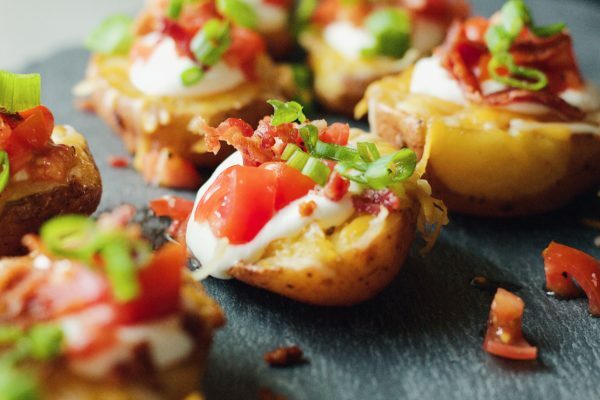 With so many get togethers from football and basketball season to little friend’s nights or even rewinding to the holidays or galentines, fully loaded potatoes are the absolute wave for the table. I personally just love that they’re small and “bite sized” enough for anyone to just grab and go. You can setup a station where people can top it (similar to a taco station) or you can already serve them with everything completed. All you have to do once you’re done cooking is make sure people have a drink in their hand and are ready to have sour cream on their face. The only discretion I have is: they’re addicting and you might want to eat them all yourself! Get together around your table with something that you can pick-up with one hand while you have your drink in the other. Start with rinsing and cleaning the potatoes. Once cleaned be sure to let them soak in water for 20-30 minutes. While the potatoes are soaking start chopping up the cherry tomatoes then crack pink Himalayan salt on them with black pepper and a sprinkle of garlic powder. Place in the fridge. You will also need to chop up your green onions and store them in the fridge. Rinse of your potatoes and coat them with garlic olive oil (or olive oil). Then season the potatoes with the s&p, garlic powder and paprika. Lay the potatoes on a baking tray and put them in the oven for 20 minutes or until tender. (You can check them by poking them with a fork). While the potatoes are cooking in the oven you'll want to start cooking your bacon. Get it crispy enough so you can chop them up or break them into little bits. Don't forget to lay them on paper towel to take excess oil from it before chopping. Once the potatoes are soft enough, you'll take them out of the oven and press the back of a serving spoon or tablespoon spoon on them so you can gently flatten them a bit. Place back in the oven for another 10 minutes or until you notice a nice browning or "crunch". Take the potatoes out of the oven and let them cool just enough so you can top them with sour cream, the chopped tomatoes, bacon and green onion. Be sure that you serve them on a tray before topping and once you've loaded up your potato, take a nice photo!